Institutions of artistic excellence are unavoidably expected to be at the forefront of innovative display methods, often turning to Pro Display to help achieve the perfect visuals to showcase incredible pieces of work or advertise to their needs. Those blessed with creative skills can sometimes struggle to find traditional display solutions that fulfil their vision, requiring unique and specialist technologies that can achieve unconventional visual effects. Some of the most prestigious art establishments have looked to Pro Display to help work out such solutions, using the vast range of cutting edge and versatile technology to bring amazing visual scenes to life that are fit for organisations that prioritise, or indeed require that very thing. A popular technology that fits incredibly well in such an environment is Switchable Glass or Film, a visual marvel that changes the state of glass from frosted to clear at the press of a button. Pioneered as a privacy application, markets are waking up to the projection applications of such products that can offer both privacy and a 4K projection system that reverts to clear glass at will. There are limitless applications of this, fitting in impeccably well with minimalist or cutting edge style themes often seen in art galleries or art schools as either / or privacy solutions to projection screens; indeed some of the more creative installations see it used in both applications at the same time. 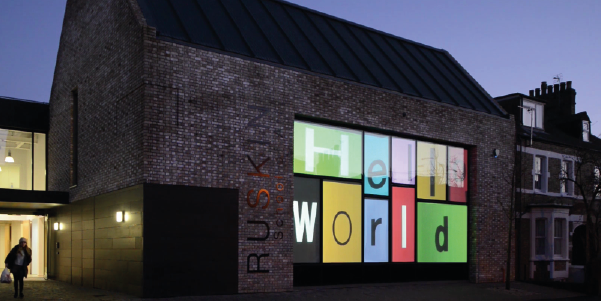 A great example of a world-class art institute benefiting from Switchable technology is the illustrious Ruskin School of Art, who use the product on an install on their outward facing windows. During the day, these large panelled windows are switched to clear, offering passers-by an opportunity to view the students hard at work on their projects or even admire the artwork itself. During night time out of hours, these windows are switched to frosted, adding extra safeguarding for the building so nefarious opportunistic criminals cannot see the potentially expensive art work inside. What makes this installation particularly interesting is their use of the projection functionality by projecting messages on the windows in the dark, ensuring that the building represents the institution’s reputation for artistic excellence even when it is closed. 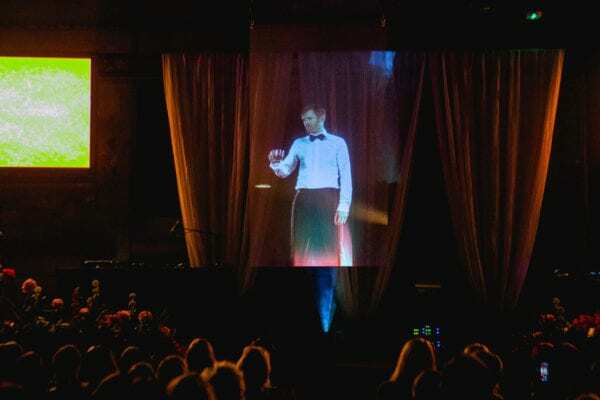 Passers-by are not just able to see the projected content, but due to the size and brightness of the windows-turned-projection screens, they are highly likely to notice it. Specialist projection screens are a particular favourite too, with Pro Display offering a range of projection options that can help the artist or designer achieve the ideal picture, whether they require a solution that provides high contrast, high gain or even ambient light rejecting properties. 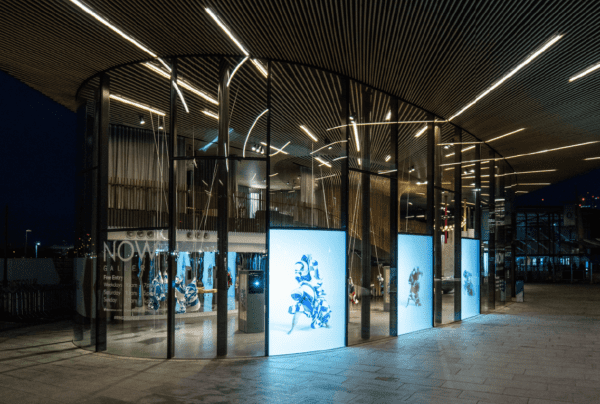 London’s prestigious NOW Gallery offers passers-by a high impact visual taste of the standard of art they should expect using 3 projection screens comprising of Pro Display’s High Gain Projection Film, which was installed in a portrait format onto their exterior facing glass façade. Using these screens, NOW Gallery are able to project images with breath-taking clarity and 4K resolution; producing sharp pictures with inherently high brightness and optimum contrast. Installing such screens in this location makes for incredibly versatile fixtures that can be used for whatever advertising purposes required, from advertising events, special offers, providing information or simply to just advertise a specific exhibition. Aside from the more traditional specialist range, Pro Display also offer highly specialist projection technology that performs in a range of unique applications, such as their UST laser projector and the revolutionary Digital Glass; an amazing solution that offers a seamless screen up to 8×3 metres, or the remarkable Clearview Holographic Effect Projection Film; an amazing invisible projection film that creates a ‘Pepper’s Ghost’ visual effect. These technologies can satisfy many artistic visual endeavours, with Digital Glass enabling projects at enormous scale and Clearview creating holographic effect imagery, to name a few clear examples. Pro Display offer an additional wealth of display technology that would suit the class and elegance of an artistic environment. Mirror screen displays provide an incredibly innovative way of displaying content or adverts that is ideal for these kinds of spaces, only offering a unique way of displaying content, but also a fantastic way of combining the functionality of a mirror and a display screen. This technology is a great way to make spaces look open, bright and spacious whilst remaining visually productive, helping to advertise events, special offers or even specific exhibits in a very stylish way. The Pro Display Group offers a solid range of products that will excite your customers. In addition to the products mentioned in this article, there is a wealth of information about our product options available to you on our Pro Display or Intelligent Glass websites. 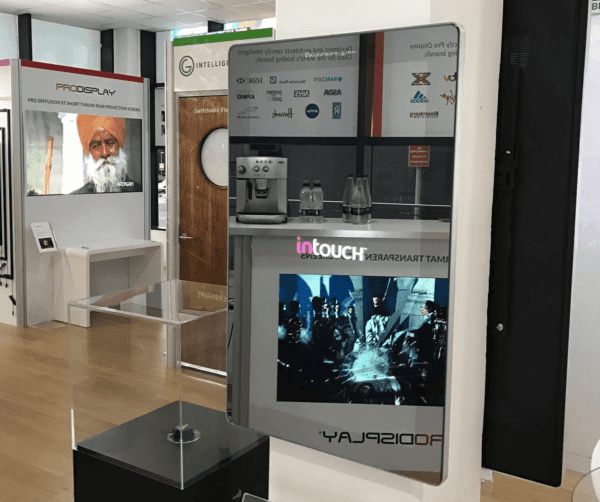 If you have some ideas about how you would like to integrate our technology into your displays, please get in touch using the form below, or call us on +44 (0)1226 361 306.